Art can be a difficult subject to discuss. I believe that its very subjective nature defies particular definition. Many times what one person considers beautiful, another might scoff at…what one enjoys to hear, another might find cacophonous. The point of Art to me lies in a reality deeper than mere aesthetics, a reality that we share simply in our existence within a community, whether that be global or local, and the perception or interaction with that commonality in some vital way. Art may be a refinement of ideas through industry, or the distillation of various principles into something unique and recognizable; it comes to being by either practice or inspiration. In today’s world, we are increasingly reminded of our connection to our environment both in a literal fashion but also in a much more intangible, esoteric sense. How our environment is shaped directly effects how we come to know ourselves and it is this perception that challenges who we are and what we want to become. The belief that it is important we recognize that this is a choice, reflects how we live and what intentions we bring to our various communities. Intention to live within an environments ability to sustain a certain lifestyle over generations creates tradition. In a very simplistic way, it is this fundamental aspect of community that makes up the nuts and bolts of the many parts of our lives. Tradition allows for the development of communication, both broad & base, it lends itself to innovation and specialization from the recognizable styles of the homes that we inhabit, to the food that we put on our tables, the sounds of the music that we love, and the art in it all that we share. I don’t get up in the morning and say I am going to make art; I get up in the morning and go to work. In my life it has required discipline and practice to achieve inspiration…I may have a preconceived notion of the form that I want to investigate based on a desire to experiment or the challenge of a new shape, but in the end I am subject to the natural laws and inherent rules of the materials that I use. Wood itself is a living thing, many times the pieces that I am working with are older than I am, and I try to treat that awareness with the respect of a witness. There exists an entire, traceable, unique story within the lifetime of a tree that can be revealed in working with it as wood. I have come to believe that this alone is worth a lifetime of work, investigation and learning. Using the wood lathe is unlike any other aspect of woodworking. The nature of turning requires a prolonged state of concentration. The process itself demands a type of meditative effort not unlike throwing a clay pot, only it is completely reductive like carving stone. 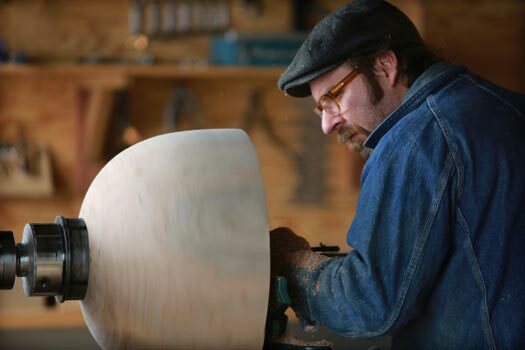 On a good day I try to lose myself in the rhythm of the machine and the spinning wood which becomes my point of departure, next the sound and the tone of the cut that I am making and ultimately – if I am able – the resonance of the wood itself. The confluence of all these efforts has everything to do with the ease, clarity, and success of form. Rhythm is a major motivating force in all my work whether it be simply sketching or the larger sculptural works, I attempt to use it to connect to a deeper creative force which I believe can only happen when I am not fighting against the nature of the materials and the processes at hand.